Today we left the lake and climbed over into a different area again. We had some more off-road cycling and I decided to ride the first part of the day and leave the descending on dirt to instead ride the truck. 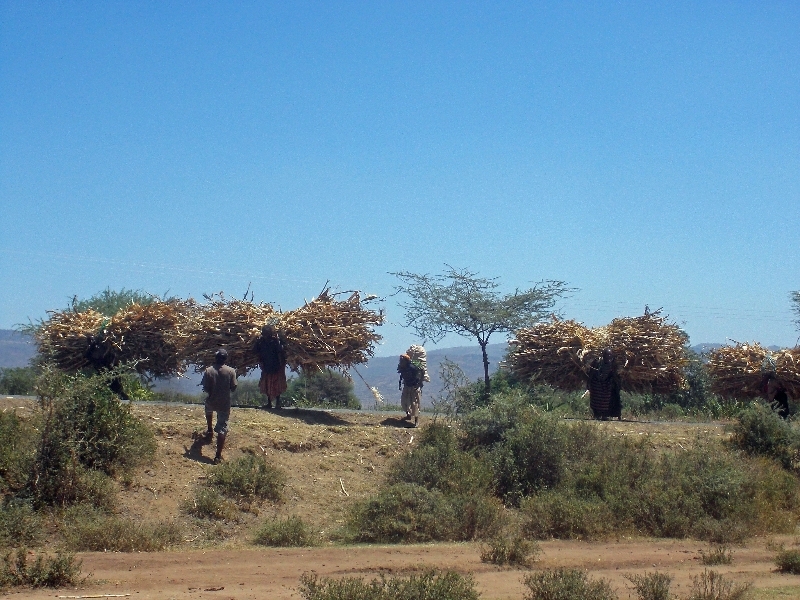 Our route started with a descent from Arba Minch towards the lake. Most of the first 9km were a slight downhill. on smooth road. We crossed a larger village just as the Sunday church services were letting out. Kids continued to be active today. After this village a very gentle climb away from the lake again. 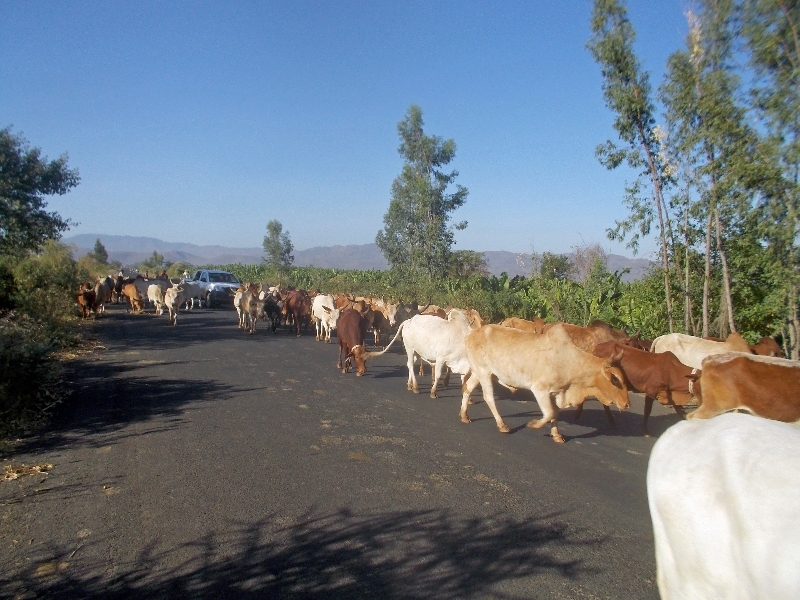 Photo below shows “traffic jam” Ethiopian style. At 36km the road split. The paved one went straight ahead and off to left was an unpaved road. We took the unpaved route coming past one more village and then more into rural countryside. At first this gravel road was reasonable to ride, but kept getting more rocky. It also climbed some, so was slow riding. I would stop occasionally including at a village for coke stop at 59km. It was warm, coke was cool and a good stop. After the village we returned to pavement and lunch was parked 3km further. I was still feeling strong, but knew there would be more climbing in the heat and a descent on gravel, so opted to ride rest of way to camp. 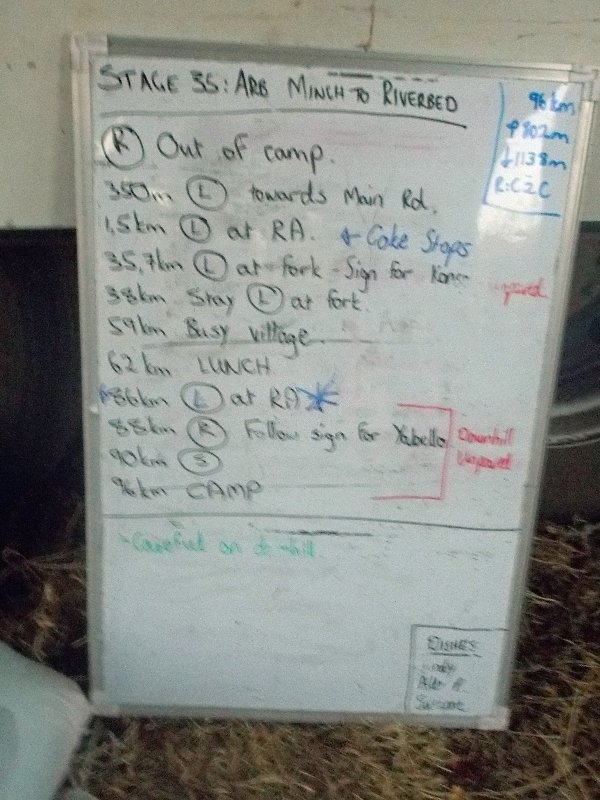 From 59km to 86km was all paved and there was a roundabout at top with a gravel road heading down to camp. Looking at the road, I was happy not to ride it down. Our camp was in bottom of dry riverbed. Some goats coming through but otherwise a quiet camp.